They've overcome bouts of adversity all season long with injuries and a crazy trip to China in the preseason amongst them, and they ripped off a 19-game point streak that registers as the second-longest in franchise history. With David Pastrnak getting ready to return to the B's lineup, they will once again have the NHL's best forward line and all three members should once again pass 30 goals when it's all said and done with Patrice Bergeron just three goals away from the magic number. They could finish with the second-most points in the NHL this season as the B's sit tied with the Calgary Flames at 95 points with 10 games left to go for both organizations. The Bruins even have plenty of comeback wins down the stretch and their own pregame pump-up speech from MMA brawler Conor McGregor along the way, so there's plenty of Black and Gold mojo going as well. So there's good reason for those backing the Bruins to get pumped up with bodies also returning to good health, and Matt Grzelcyk, Torey Krug and Marcus Johansson expected to also join Pastrnak back in the lineup sooner rather than later. So it's a pretty good time to be the Bruins comfortably sitting second in the standings in the Atlantic Division, and holding a four-point lead over the struggling Maple Leafs for home ice in the first round of the Stanley Cup playoffs. "It's nice to look at yourself and where you are in the standings and take a deep breath and not be that team like – you know… I'd much rather be us right now than those teams that are seven, eight, nine [in the playoff standings]," said Bruce Cassidy. "[The teams] that are one point in [the playoffs] one night and one point out the next night. That's nerve-racking, so for us, like I said, we're paid to win, and we're doing a lot of that lately. So that's comforting." So why aren't more people getting truly excited about the Bruins' chances next month once the playoffs get going? Well, it's probably got something to do with what awaits them in the second round of the playoffs should they advance past Toronto. The Bruins could finish second in the entire NHL in points when the regular season is over, and that wouldn't prevent them from playing the league's best team in the second round of the playoffs. That's right, the Tampa Bay Lightning are looming in the second round of the postseason again this year for whichever team comes out successful in the expected Bruins/Maple Leafs series. No matter how strongly the Bruins finish and how many teams they beat in the final 10 games leading up to the postseason, does anybody truly think it's going to be any different from last season? Is there even a shot that the B's are going to last more than the five games they managed last season when they were outclassed by the Lightning, and overwhelmed by their overall depth, after the first game of the series? 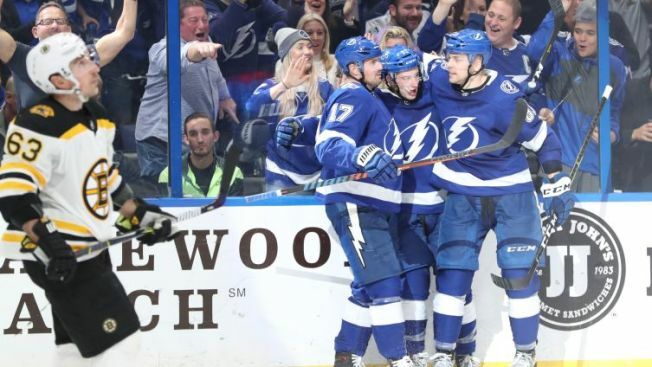 The Lightning are deeper, more offensively explosive than the Bruins, stronger on the back end with big bodies everywhere and more of their core players are on the young end of their prime years. On paper it really doesn't look like the Bruins will come out on top. Certainly there's a chance, though. Tuukka Rask could get hot and carry the Bruins through a playoff series like he never has before, or the Lightning could end up suffering some injuries that take away from their overall attack. But the bottom line is that the Bruins are going to need some help to even get out of the second round, and that's probably going to make it difficult for a fan base to get too excited when they're already drunk on Red Sox and Patriots championships within the last year. The Bruins will get their chance to stir up the enthusiasm with two more games against the Lightning before the end of the regular season, including one just a week from now in Tampa with both teams rested and ready to make a statement. Maybe the B's will swing into an Amalie Arena where they've almost always played well and push around a Lightning group that barely broke a sweat ending their season last spring. But it's going to take a hell of a regular-season beating to make everybody believe that the Bruins truly have any kind of a shot in a second-round showdown with Tampa Bay. It would be foolish to completely overlook the Leafs in the first round as well, but it's just as tough to blame anybody that isn't contracting Black and Gold fever right now. It's going to take quite a bit for the Bruins to even get to the Eastern Conference Final this season, and for most B's fans, they will believe it when they see it.